As I mentioned last week I'm very pleased to announce that my next book, Saved! Backing Up With EaseUS Todo will be available very soon. If you're unfamliar with EaseUS Todo I've put together a short video series that demonstrates how to create image backups and restore them using Todo. If you're curious at all as to how Todo works or what it looks like, this is a great start. To be clear, my recommendation of Todo is in addition to my recommendation of Macrium Reflect. You may remember that some months ago I asked for suggestions on what backup program I should add to my toolkit of recommendations. Oh, and did I mention EaseUS Todo's free? While there is a paid version, it's the free version I use in the example above, and the free version that I'll be covering in more depth in Saved! 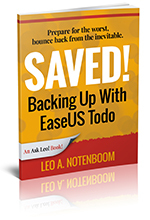 Backing Up With EaseUS Todo. 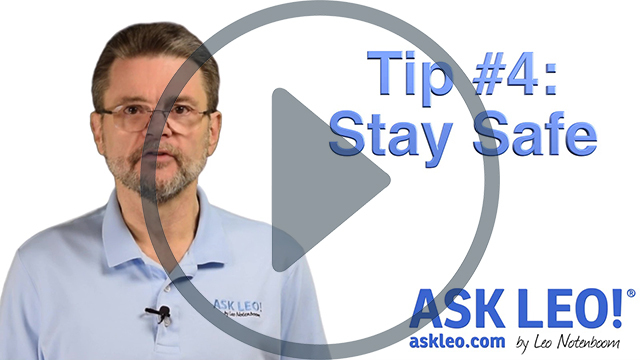 Continue Reading: Tip #4: Stay Safe! My hard drive states that failure is imminent and I should replace it immediately. My questions are as follows: When I replace my hard drive, will I need to install a new operating system? Is there a way to clone my current hard drive completely including my operating system? If I am able to clone my entire hard drive, will I need hardware or some device to set up between the old hard drive and the new while I do the transfer? What is the best way to save my existing files if I can't salvage my entire hard drive? Are there software programs that can help me do this? There are indeed programs that can help. While there are many, many ways to do what you're looking to do, I'm going to review what I think is the most appropriate way. In fact, it's the exact way that I frequently do exactly what you're asking about. Continue Reading: How do I transfer my system to a replacement drive? My son installed BitTorrent on the house computer. This of course, without asking first, as is the rule. This program slowed my computer down so much that I could not get online. I found out that as it was downloading, it was also uploading with unlimited bandwidth. I could not find any information on what it was uploading. I dislike P2P because of past experience with them, virus, spyware and the feeling I am stealing from the programmer. This program was promptly uninstalled. Is there any legitimate use for P2P programs? This is a sad case of some very amazing technology getting smeared with a bad reputation because of how some people choose to use it. Absolutely: there are many legitimate uses for peer-to-peer file sharing (P2P) programs like BitTorrent. In fact, I wish it were used more. In order to understand why peer-to-peer file sharing is interesting, we first need to understand just a little about how traditional file sharing and downloads work. Continue Reading: What is peer-to-peer file sharing, and is it legit? What's the difference between i3, i5, and i7 processors? UEFI is an acronym for Unified Extensible Firmware Interface. It is occasionally, albeit technically incorrectly, referred to as "UEFI BIOS". One of the more notable, and occasionally frustrating, features of UEFI is "secure boot". Secure boot allows the boot process to be "locked down" according to the PC manufacturer's specifications, preventing unauthorized operating systems or boot sources from loading. Like the BIOS, the UEFI is typically stored in re-programmable ROM, allowing it to be updated using special reprogramming software. Unlike the BIOS, additional portions of the UEFI may be stored on reserved areas of a computer's hard disk. This may seem a strange question but - since I have yet to suffer a disaster that requires a full system back-up, how do I know that my back ups, either with the Windows "Backup and Restore" in control panel (scheduled every day to an external hard drive) or the occasional Macrium back up, will work when that disaster strikes? Do I have to risk using a backup that may not work, to test it on my only lap-top? Have I lost my operating system? Is there a step by step checklist that we mere mortals can use to test the functionality of our back-up without actually overwriting the whole operating system? I have had occasion to use a "Restore Point" but is this the same thing as backing up? Sorry if it seems to be a lot of questions but, to be honest, I'm one of the scared ones - afraid to try what seems to be a leap in the dark. I have been using EaseUS Todo Backup for 2-1/2 years now, and I am very pleased with it. Right now I am using their Workstation version 8.8. I chose the Workstation edition because of the ability to restore to dissimilar hardware. I have tested that out and it works perfectly. Another factor to consider is support. I have emailed EaseUS many times over the 2-1/2 years and have always received a fast response. I also stumbled onto several undocumented features because I like to play around. One that I think is useful I will mention here. 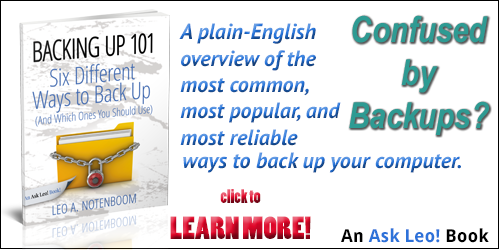 You can actually start two backups and when the first one completes, the second one will run without you having to do anything. I have used this feature to first make an image of my C: drive, then make a backup of one of my USB drives. I set the first backup to "Do nothing" when completed, and to "Shut down" after the second backup. Oh, and to Phil Lense's question, EaseUS has an option for burning a UEFI rescue disk. "Does this mean that when my 8-year-old computer finally dies and gets replaced, I can restore the image from my current computer to it?" - Theoretically, yes. Note, however, the bare metal restores to dissimilar hardware can be problematic. Sometimes they work; sometimes they don't. I think it's much better to start fresh: reinstall your programs and then restore your files from a backup. For sure, it's less convenient doing it this way, but it's much more reliable.